You may contact us by any of the methods below or by filling out the form at the bottom of this page. Email Please use the form at the bottom of the page. Bank details are available on request for all EFT donations and payments. From the N1: Take the N4 toward Emalahleni. Travel east on the N4 for about 6 km. Take the Simon Vermooten off-ramp. Turn RIGHT onto Simon Vermooten. Pass the Deutsche Schule on your right. Go over the first traffic light (Albertus / Bush Street). In about 500m turn RIGHT into Havelock Street. Proceed to the end of Havelock Street, then at the T-junction turn RIGHT into Vivian Road. Grace Fellowship is on the left-hand side (Plot 34, Vivian Road) across the entrance of “Cakes For Africa”. 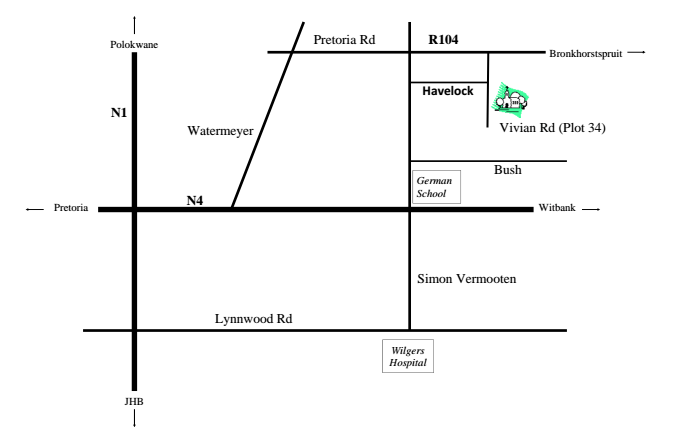 From Lynnwood Road: Turn into Simon Vermooten (at Wilgers Hospital). Head North for about 4km (cross over the N4, pass the Deutsche Schule on your right, over the traffic light (Albertus / Bush Street). In about 500m after Bush Street turn RIGHT into Havelock Street. Proceed to the end of Havelock Street, then at the T-junction turn RIGHT into Vivian Road. Grace Fellowship is on the left-hand side (Plot 34, Vivian Road) across the entrance of “Cakes For Africa”. Grace Fellowship Church honours Christ through the exposition of Holy Scripture, corporate worship, the fellowship of the saints, and the reaching of the world through the proclamation of the Word of God.